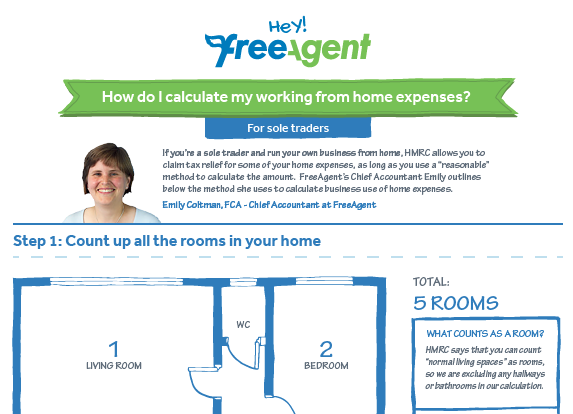 Calculating your expenses when working from home #Infographic - Your journey to a new career. Are you looking to run your own business from home, but not sure what costs you can claim for? This guide will show you how you can claim tax relief for some of your home expenses. The infographic describes an easy to use “reasonable” method to calculate how much of your heating and electricity, rent, council tax and so on you can claim tax relief on. The method involves looking at how many of your rooms you use for business and how long for. You can also claim for your telephone and broadband expenses. Alternative methods are also shown. Whilst easier to calculate, they may not truly reflect how much you use your home and so could lead to your underclaiming. Once these calculations have been done, you will have an overall amount for business usage that is then counted as a business expense, which will reduce your tax. For anyone looking for a job but considering running a business themselves from home, this guide will show you how you can reduce your tax costs, and avoid some common mistakes when dealing with HMRC.